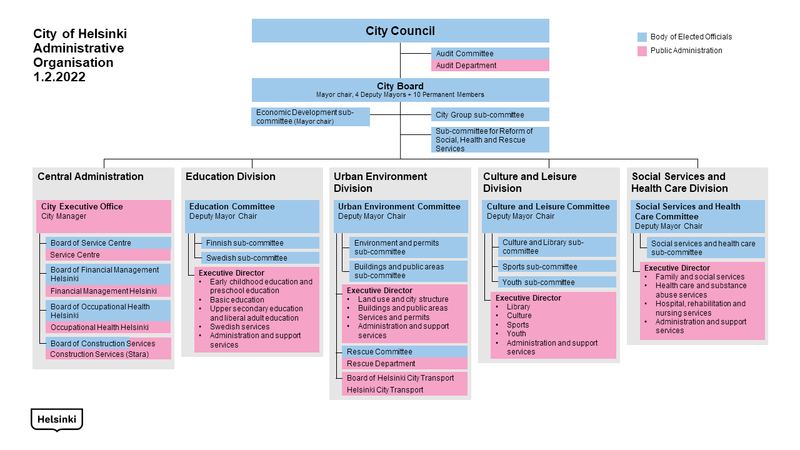 The highest decision-making organ in Helsinki is the City Council. The Council elects the Mayor and four Deputy Mayors for the duration of the Council term. The Council also makes appointments to city organs and the most important offices. The Mayor serves as the chair of the City Board, and the Deputy Mayors chair the sector committees. The Mayor and Deputy Mayors are full-time elected officials. The Education Division consists of four segments, which are early and preschool education, comprehensive school education, general upper secondary and vocational education, and Swedish-language operations including the Swedish Adult Education Centre Arbis. The Urban Environment Division consists of three segments, which are land use and city structure, buildings and public areas, and services and permits. The rescue function and the Helsinki City Transport (HKL) municipal enterprise are organizational units corresponding to segments. The Culture and Leisure Division consists of three segments, which are culture, youth and sports. The culture segment comprises the Cultural Office, Helsinki Art Museum HAM, Helsinki City Museum, the Helsinki Philharmonic Orchestra and Helsinki City Library. The Social Services and Health Care Division’s segments are family and social services, health care and substance abuse services, and hospital, rehabilitation and care services.